Bio: Gonzales earned three varsity letters in baseball at El Camino High School and was a San Diego Union Tribune All-Academic team pick. He won four games and struck out 28 with a 2.52 ERA during his senior season. In his freshman season at Dixie State, Gonzales struck out 14 and walked 12 in 15.1 innings while compiling a 3.52 ERA in 11 appearances. Bio:Gonzales earned three varsity letters in baseball at El Camino High School and was a San Diego Union Tribune All-Academic team pick. He won four games and struck out 28 with a 2.52 ERA during his senior season. 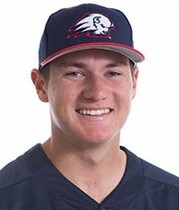 In his freshman season at Dixie State, Gonzales struck out 14 and walked 12 in 15.1 innings while compiling a 3.52 ERA in 11 appearances.